Before moving to the southwest I always considered Edward Curtis’ 1904 photograph of Navajo on horseback riding through Canyon de Chelly quintessentially the West. The canyon is not only a primary motif in the art of the West, but has been home to indigenous people for thousands of years. Riding or hiking through the canyon at certain times of the year, it’s hard to imagine the crops that the Navajo have grown there. One surprise is peaches. An account of an expedition into Navajo country in 1849 mentions the party being greeted by the Navajo with blankets full of peaches. Fifteen years later the peach trees were destroyed in Kit Carson's scorched earth program, which preceded the tragic Long Walk when more than 8,000 Navajo were forced to leave their land and walk 300 miles to a fort in eastern New Mexico. G. Russell Case painted the canyon from above in his October in Canyon de Chelly with yellow cottonwoods, a flock of sheep and a hogan. Case paints the soft colors, light, shadow and the monumentality of the canyon from reality filtered through is imagination. His outlook echoes that of Thomas Moran I1837 - 1926), whose work he admires. Moran wrote. “I place no value upon literal transcripts from nature. My general scope is not realistic: all my tendencies are toward idealization" Case’s idealization may be more real than a literal rendition, capturing its essence in addition to its materiality. Gary Ernest Smith paints the unexpected colors of the landscape in Coral Sand Desert. He says, “Art is a way of addressing humanity, and my works attempt to merge ideas and memories. Good art functions on many levels. There is the surface appeal of subject, and below that are layers that may be peeled off, revealing information about the individual artist and the psychology of his era. There’s the subject but there's also the underlying theme.” Smith likes to paint the presence of man in the landscape, but here he portrays the complex beauty of the land itself. 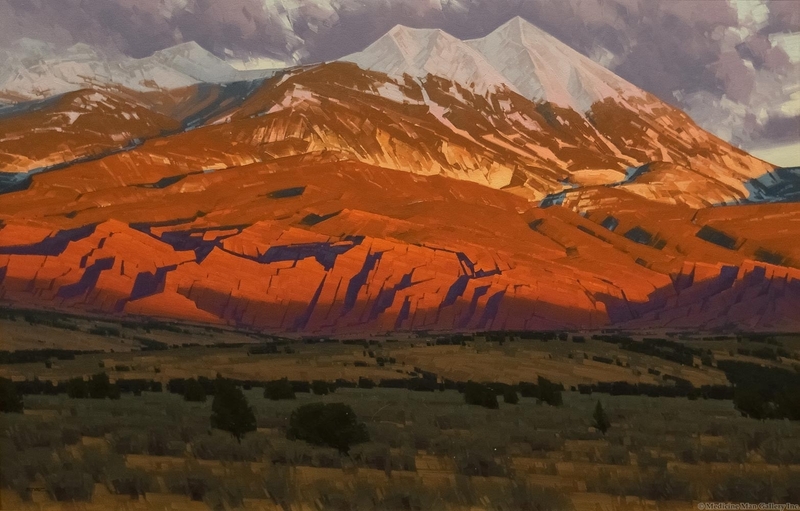 Commenting on Steven Datz’s Heart of the Fire, Medicine Man Gallery president Mark Sublette says, "Most don’t think of mountains with snow as desert regions, but in fact many mountain ranges fall in areas which are classified as true deserts. 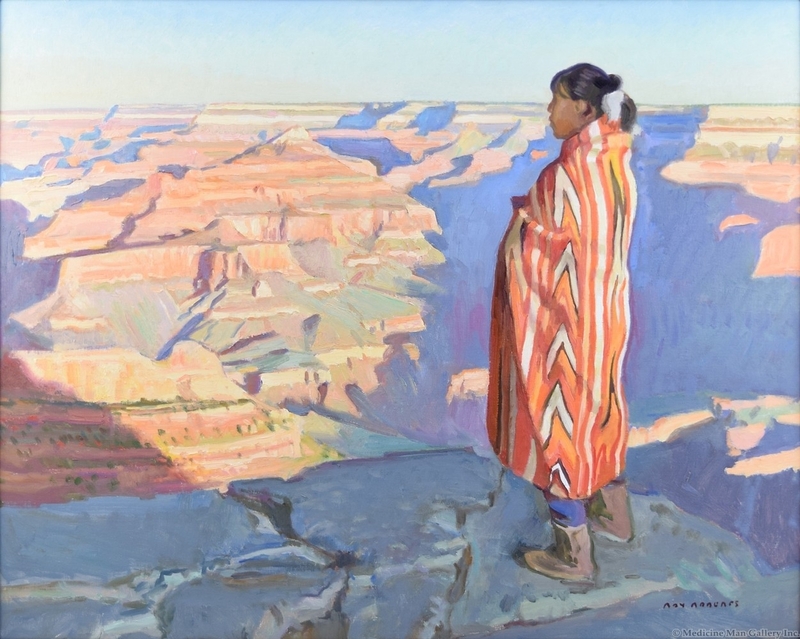 As a native Coloradan, Datz understands the Southwest's vibrant colors of red and orange, which are trademarks of his paintings.” Also at the gallery are works by Ray Roberts, whose canyons and blanket series will be on view at the gallery in July, and Francis Livingston, whose vivid colors are reminders of the southwest. in June, visitors of The Erin Hanson Gallery can view a new collection of works by contemporary impressionist Erin Hanson—a collection featuring pieces inspired by her adventures through the national parks and monuments of Arizona, Colorado, Nevada and Utah, according to gallery manager Amy Jensen.